This post is for all the people who are doing their utmost to protect their dog by using a muzzle, and hopefully dispel any myths or stigmas surrounding muzzles. The first thought that might enter someones head when they see a dog with a muzzle is ‘that dog is dangerous’. And whilst the dog may have a history of aggression, that is not always the case. 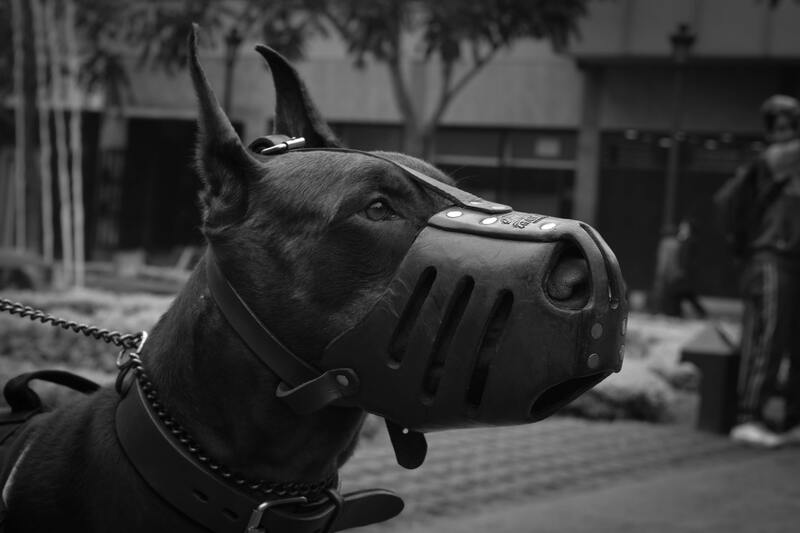 Because of the stigma surrounding muzzles, it has become a tough decision for an owner to make. And I must commend those that have taken the responsibility to deal with the dog’s issue, or at least prevent an incident from happening. There should be no stigma for being a responsible dog owner! The dog is aggressive. Without going into all the reasons why the dog is aggressive, the dog ‘could’ bite, and it’s there to protect any other dog that approaches. It’s a human deterrent. Because of the stigma, most owners who see a muzzled dog will avoid it. Which is great news if you have a nervous dog that everyone seems to like to pet, or who allow their dogs to greet. It creates enough space so the muzzled dog does not get too anxious. He likes to pick objects up from the ground. For a dog with pica, or on who just likes to run away with rubbish, eat slugs, swallow stones, or pick up poop, a muzzle can help while ‘leave it’ and ‘drop it’ training is ongoing. Redirected Aggression. Some dogs attack their owners, or other family dogs when they become over excited or frustrated. When should a muzzle be used? When walking. If the dog has a history of aggression, it is always safer to use one and not need it, than not use one and regret it. In an emergency. If the dog has been injured, or is in pain, however well known the dog is, he could bite if touched. When being handled by a stranger. A dog who has not been conditioned to accept handling by strangers from a young age is more likely to bite. If in doubt, it is best to use a muzzle when being examined by the vet, or handled by a groomer. For training. It’s always best to condition a muzzle through gradual training well before you might need it, even if you have the most sweet natured dog. Some vets insist on using a muzzle on every single dog when doing procedures such as taking blood samples. Please give the dog space. Put your dog back on leash. Do not attempt to pet the dog. Do not approach the owner. The dog is muzzled for your’s or the dog’s safety. Having a dog who needs a muzzle is difficult, and it is often a last resort. The decision to use a muzzle is never taken lightly, and there is far too much stigma and judgement, owners often feel bad enough about it without the extra comments. Make sure the muzzle fits properly. Make sure that the muzzle allows the dog to pant, drink water, and take treats. Create a positive association for the dog to accept the muzzle. Don’t forget to train your dog! The muzzle is a preventative measure, it is not a substitute for good training. Use high value treats lick chicken, hot dog, or cheese. Show the dog the muzzle, then reward him with the treats. When he moves towards the muzzle to investigate it, reward him several times. When he is happy to investigate the muzzle, place a treat in the bottom, allow him to get the treat and remove his head. Build some duration by feeding several treats through the bottom of the muzzle. Use some yummy treat spread such as squeeze cheese or peanut butter spread on the bottom of the muzzle. Allow your dog to lick the treat. Spread the treat on the bottom of the muzzle, then begin to hold the straps around his head, and release. Build up duration slowly, then begin to fasten and unfasten the straps. Place the spread on the muzzle, fasten the straps and allow the dog to lick the spread. When all of the spread is gone, remove the muzzle. Build up duration of wearing the muzzle slowly. Make sure the dog receives lots of treats and praise whilst wearing it. When the dog is able to wear the muzzle happily for 15-20 minutes at home, it can then be used during walks or vets visits. Categories: Dog Behaviour, Dog TrainingTags: basket muzzle, dog aggression, dog eats slugs, dog eats stones, dog muzzle, dog pica, dog training, fearful dog, how to use a muzzle, leash aggression, nervous dog, should i muzzle my dog?, why do dogs wear muzzles?